In this drawing workshop, I was encouraged to experiment with anthropomorphism. Anthropomorphism is the attribution of human form or other characteristics to anything other than a human being. In this case, we were looking at the attribution of human motivation with plant life and natural phenomena. As well as the relation between the plants and the model, we looked at relief work and experimenting with cutting paper out and sticking it onto our drawings to make a much more free image and shape than just the rectangle of the paper we were given. There were a few initial artistic inspirations that were considered before creating the outcome. This workshop was from life so a life model surrounded by plant life was present. 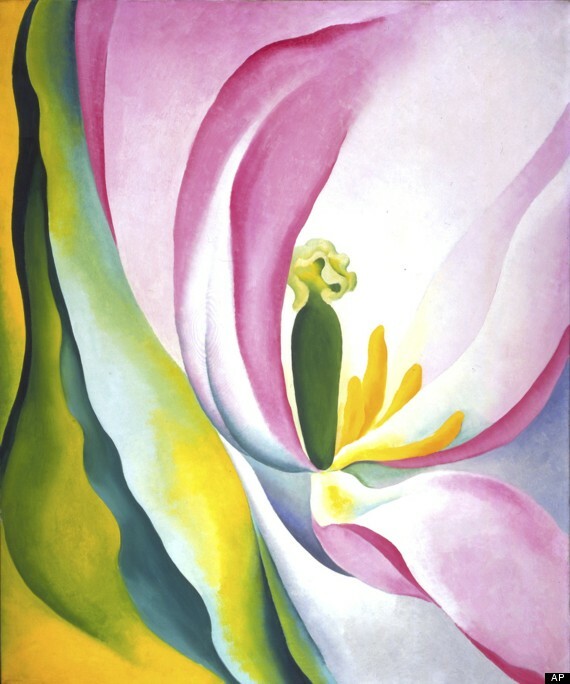 The artists that stood out to me to inspire my piece were Henri Matisse, Graham Sutherland, Ruth Daniels and Georgia O’Keeffe. Henri Matisse favoured drawing from life. It is interesting to look at his piece below because the plants almost seem more important in the composition than the figure does. I am drawn in by the loose handling used to render the leaves and the fact that the leaves are varied in size and shape. To me, the plants are a far more interesting subject to look at within this painting and I don’t immediately notice that she is there. This inspired me to think about displaying the figure or face of a human woman amongst the foliage around her. 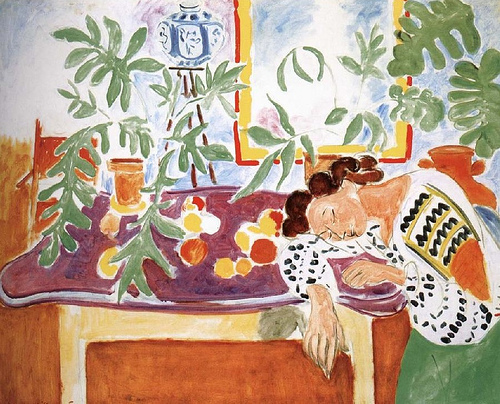 Matisse’s work inspired me to use a bright colour palette and to not be too controlled in my approach. 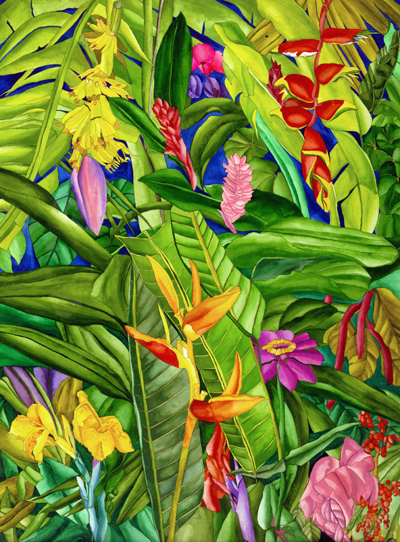 This piece also gave me an insight into how the plants and the model can come together to make a successful artwork. 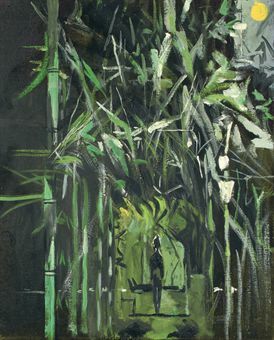 Graham Sutherland’s piece “Bamboo forest“ showed me how I could approach drawing and incorporating an expressive element into my piece. I like the limited colour palette in this work and it inspired me to fill the page and cram lots of plant imagery together. Here he has portrayed the plants dominating the figure and there is a sense that the figure is intimidated by all the foliage. I wanted the figure and plants to be harmonious together in my work so in a way Sutherland’s work showed me how to do that by showing the how not to do it. The Bright colours in the work of these two artists were highly inspirational to me, they influenced me to use iridescent colouring within my own work and think about placing colours together to make a more striking effect. The Blending of colours was something that caught my eye here aswell which inspired me to be tonal in my work rather than thinking about the use of block colour. Above is an image of the piece I produced within this workshop. I am fairly happy with how it turned out and the model and the plant life have definitely come together as one. The bright colour palette and leaves remind me of a carnival atmosphere. I think the fact that the shape of the piece is irregular adds to its success, it would not be as interesting to look at if it was simply rectangular. 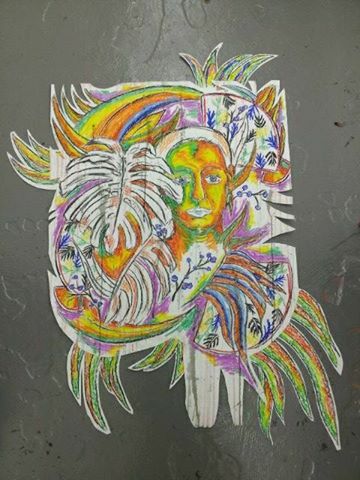 To create this piece I have used a variety of medias including charcoal, oil pastels, paint, ink and chalk pastel. I think leaving some of the piece white was definitely a wise decision as it heightens and accentuates the bold colouring of the piece. I found it quite difficult to decide which bits of the life model and plants that I was looking at to include in my work and struggled at first to be selective. This workshop taught me that you do not have to draw all of what you see for the image to be successful and that you can combine two or more completely separate subject matters relatively simply. 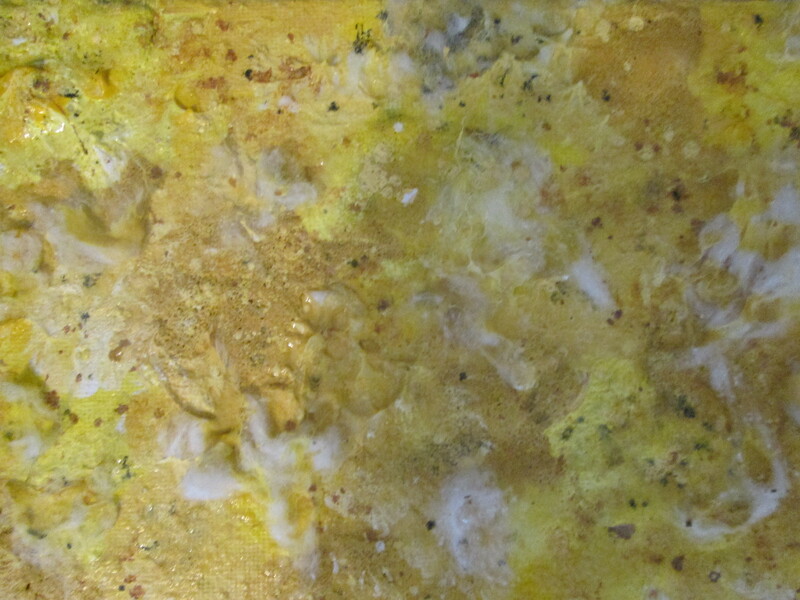 Does the Colour of Food Mould and Decay Add to the Stereotypical Repulsion of it? 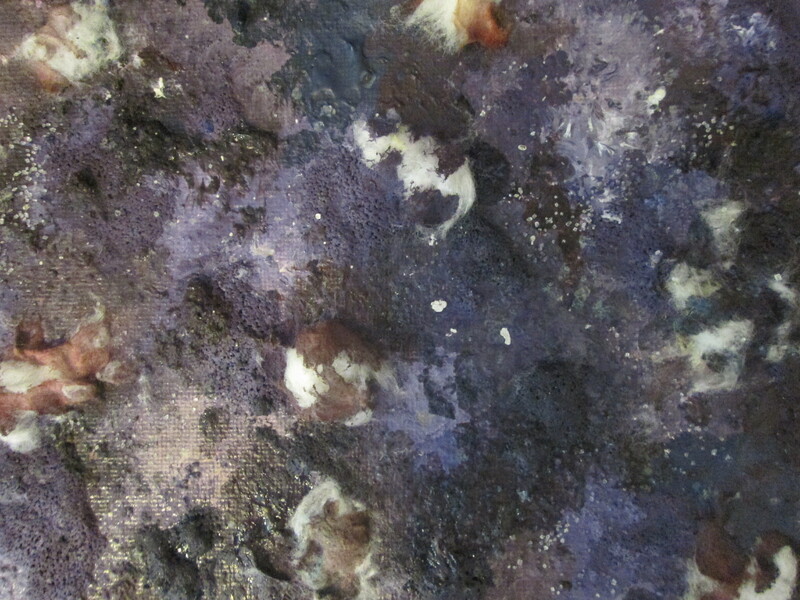 DOES THE COLOUR OF MOULD ADD TO THE HUMAN REPULSION OF IT? IF IT WAS A DIFFERENT COLOUR, WOULD IT BE LESS REPULSIVE AND THEREFORE MORE ATTRACTIVE? IF YOUR FOOD SUDDENLY DECAYED IN BRIGHT, APPEALING COLOURS WOULD YOU BE LESS DISGUSTED BY IT? These are some of the questions I asked myself when producing this series of six different coloured moulding canvases. 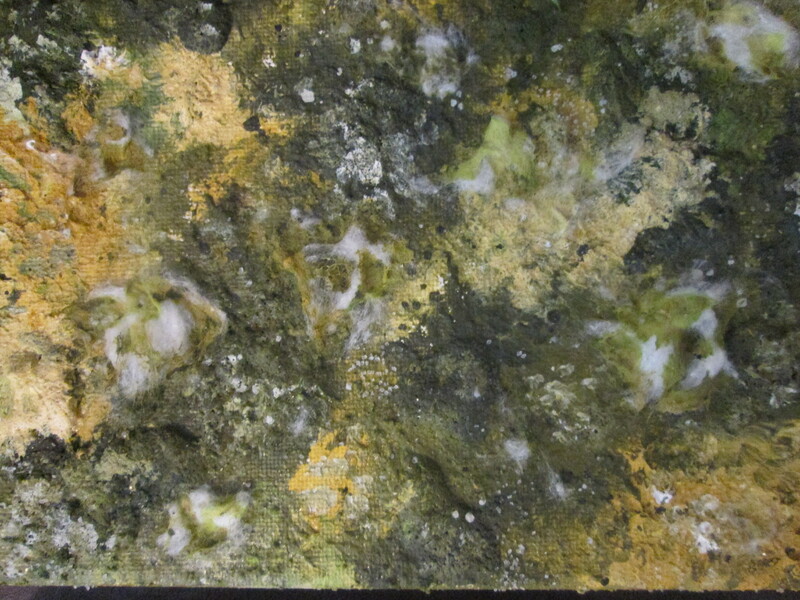 To me, It is obvious which one of these paintings looks like mould because of its colour! In these six pieces, I have experimented with making mould in exactly the same way as I have in past replica moulding canvases. However, here I have painted them in more attractive colours as well as the stereotypical greeny brown colour that mould is. The textures and materials used are exactly the same in all of the pieces but the colour of the pieces definitely change how you think about them and their visual appearance a lot. 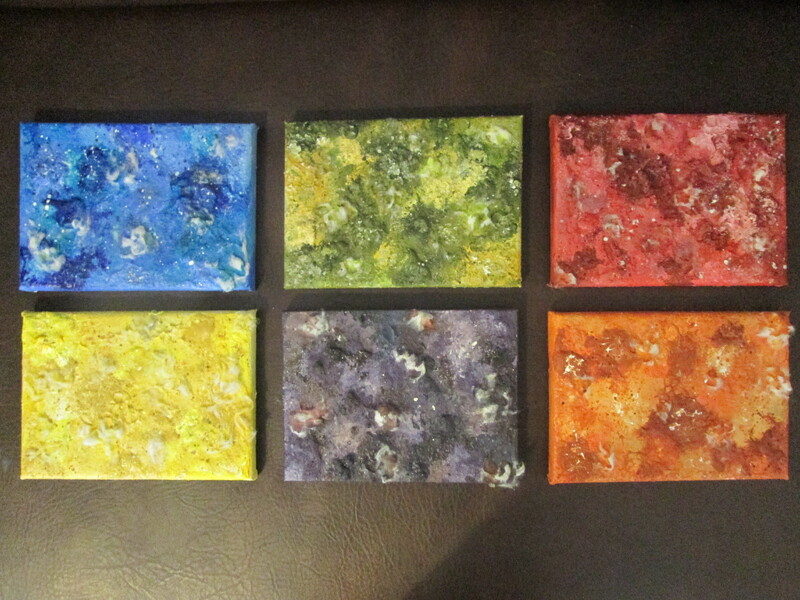 In my opinion, this set of six as individual pieces and as a piece as a whole are highly successful. Although all of the pieces are incredibly interesting, THE GREEN COLOURED CANVAS IS THE ONLY ONE THAT REALLY LOOKS LIKE IT COULD BE MOULD. 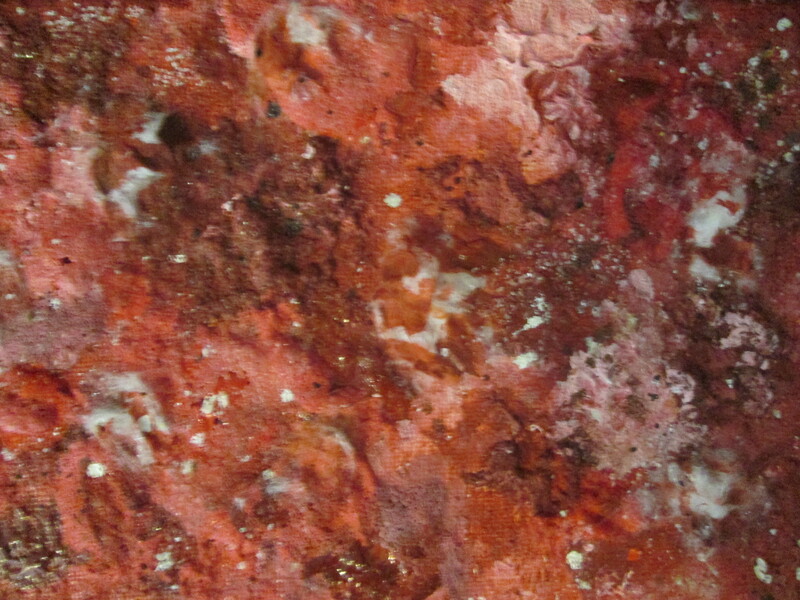 Therefore, the colour of mould DOES effect our ability to identify it and our repulsion of it. The fact that colour affects how we associate and see things is an interesting concept indeed. My experimentation here was a success and my assumption turned out to be correct, colour is a massive contributing factor to our understanding of what something is or what something looks like. 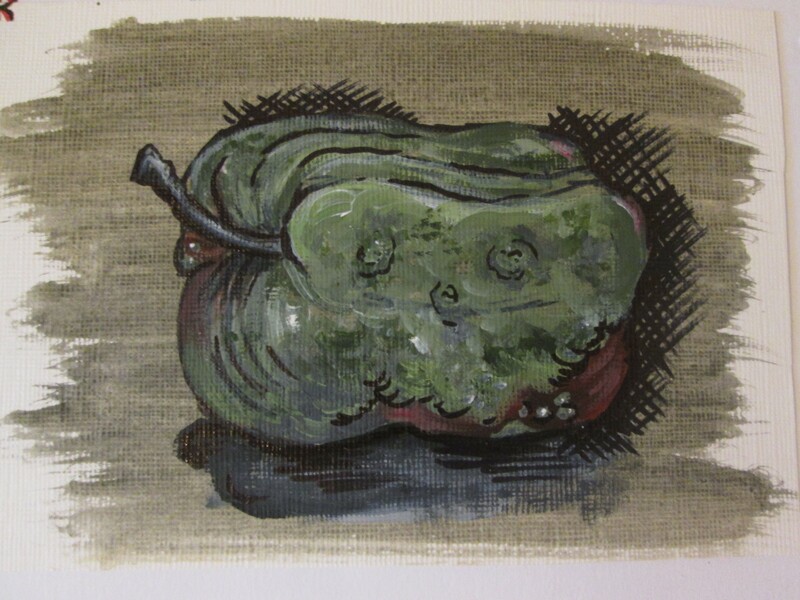 Here are some images of a few painting and drawing experiments I have produced relating to moulding fruit and vegetables. I have experimented here with backgrounds, I painted a simple acrylic wash in the colours of moulds and drawn and painted on top of them with different sized pens to explore a variety of different effects. Personally I quite like the solid painting with a dabbing technique over the top of a more transparent wash, it adds importance and solidity to the item of food I am trying to portray. I like the idea of starting with a simple background and working on top of it and it is definitely something I think I could work with on bigger pieces further down the line in my project. The thicker pen lines make the drawings look too cartoony and not as professional in my opinion. 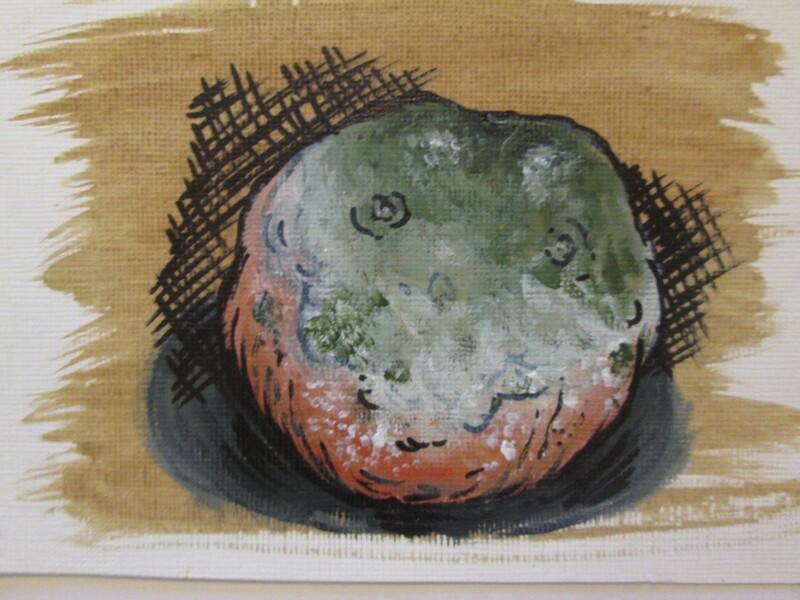 The thinner pen line looks much more presentable and fitting for capturing the essence of decaying food items. 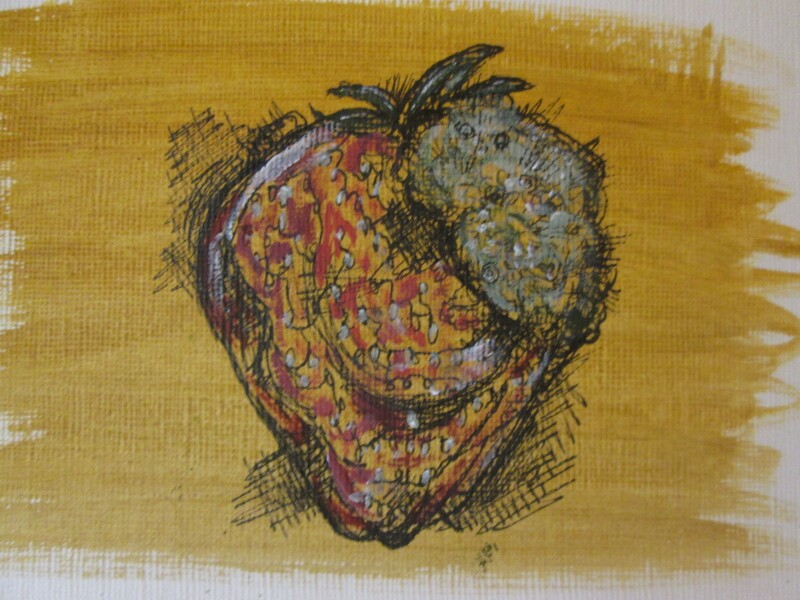 I like the thin pen lines in this piece and the way that you can see the background through the strawberry, this is also a nice effect to have within a drawing and the slight highlights make it look more three-dimensional. Cross hatching on top of colour looks far more appealing. I think adding a background to the work also changes the colour of the piece as a whole, so the darker backgrounds tend to dull the colours you apply on top a little bit which is a highly desirable effect to suit the credentials of my project. I may experiment with more drawing on top of grounds and incorporate other medias like charcoal or pastels.